Have you been protecting yourself against the sun? @TheWilsonClinic offer a full mole screening service. Have you been enjoying the sun? Britain’s weather has been extremely hot recently and here at The Wilson Clinic we want to make sure you are taking the right precautions and protecting yourself against sun damage. We always like to stress the importants of wearing sun cream, we recommend you wear sunscreen even on a cloudy day. Also remember to make sure you are reapplying your sun cream and are keeping out of direct sunlight at the hottest points of the day. Burning your skin has been heavily linked to ageing your skin faster, sun damage and even skin cancer. At The Wilson Clinic we have a mole screening facility which can check your moles and detect skin cancers early. 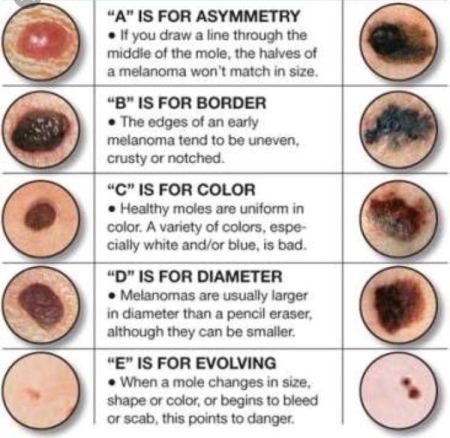 Look at this chart, if you have seen any of these changes, or have any moles you are concerned about, then we offer a full Mole Screening Service. Contact our team on 08001123393 for detailed information.